Each year, Daniel Shoptaw from C70 At the Bat asks bloggers from around baseball to do a little Q&A regarding their teams heading into the new season. Here are my answers from the 2019 edition and you can read the full post along with contributions from Matt Veasey and Matt Winkelman here. Who better to answer that question than the owner who signed the $330 million check. "I think Matt [Klentak]'s had a pretty good offseason, don't you?" he rhetorically asked at Bryce Harper's press conference. "First person in the history of baseball I'm told who signed three prior All-Stars from the previous year and that doesn't even include what he did with Aaron [Nola]'s extension and signing Dave [Robertson] and signing Cutch [Andrew McCutchen], who is obviously a former MVP." It's hard to imagine a better offseason scenario in Philadelphia than the one that took place in reality. In one move, the deal that sent J.P. Crawford and Carlos Santana to Seattle for Jean Segura and a couple relievers, General Manager Matt Klentak improved the Phillies at shortstop from one of the worst offensively to one of the best, and returned the worst defensive outfielder back to his natural position at first base. He replaced Carlos Santana's bat with Andrew McCutchen, signed one of the most reliable relievers in the past decade with David Robertson, added the best catcher in baseball with Realmuto, and locked in Bryce Harper to a potentially lifetime contract. Matt Klentak put up an MVP type season if you ask me. 2) Can Aaron Nola repeat his great numbers from last season? Repeating his 2018 season would be an awfully tall task considering Nola put up a better ERA (2.37) in 2018 than Roy Halladay did in his 2010 Cy Young season when he posted a 2.44 ERA. I doubt Nola replicates those numbers, but I have no doubt that he can come close. 2018 certainly was not a fluke of a season. With pinpoint control and a terrific curveball, Nola was already a number three starter prior to last year, but his ceiling wasn't all that much higher. That was before he changed his delivery to utilize his legs more, which added a couple ticks to his fastball. Then he incorporated an above average changeup and went from solid to lethal. The only thing holding him back at this point is health. He came oh-so-close to needing Tommy John surgery and has a history of injuries. If he can remain healthy, the Phillies could have a close equivalent to Greg Maddux. 3) What’s the strength of this team? Offense, which is amazing considering the Phillies finished with the worst team batting average in the National League last season and scored the 5th fewest runs. Now, with a lineup that might have Odubel Herrera batting 7th and Maikel Franco hitting 8th, the Phillies might have the deepest lineup in the National League. It's a roster full of speed, power, and the ability to reach base. They have a little bit of everything. One thing I know for sure is that 2019 has the makings of one hell of a dogfight in the National League East. No division in baseball came close to matching the offseason moves of the NL East. 2019 will be way, way, more difficult to win than last season. I could easily see any team other than the Marlins win this division. Is it the dominant pitching staffs of the Mets and Nationals that wins? Or is it the intimidating lineups of the Phillies and Braves? I'm going to pick the Phillies to take the division crown, because of course I will, but I am plenty afraid of the other three rivals. No matter how many runs the Phillies score this season, the success of their season likely hinges on the arms of Vince Velasquez, Nick Pivetta, and Zach Eflin. All three pitchers had flashes of brilliance at times, but they still finished with ERA's of 4.85, 4.77, and 4.36, respectively. That's not going to get it done. Many of their struggles came late in the season, when all three seemed to run out of steam - Velasquez and Eflin tossed around 15 innings more than any other season in their careers, while Pivetta roughly matched his career high. The front office showed a lot of faith in their three young starters by not making any moves in that department this offseason. The Phillies have a multitude of strong starters in the minors if it comes to that, but they need at least one or two of them to take a step forward in 2019. The whole dang thing. After a streak of five straight division titles and nine straight winning seasons in the late 2000's, this has been a rough rebuild. 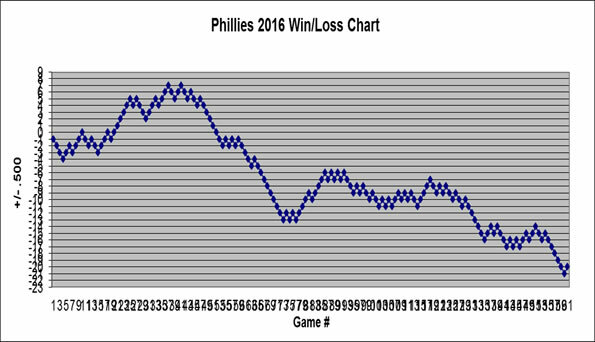 Phillies fans have endured six straight losing seasons and 89 or more losses in all but one of them. Now, finally, the wait for October baseball might finally be over. But it's more than just winning baseball. We get to watch J.T Realmuto, Jean Segura, Andrew McCutchen, and David Robertson in a Phillies uniform for the first time. Oh, and did I miss a name? That's right, we also get to watch Bryce freaking Harper! For the first time in a long time, there is a ton to look forward to. I can't wait.